In today’s world, almost all household have at least one or two leather products. Leather products can be found almost anywhere. This include leather jackets, shoes, bags, purse, boots, upholstery, motorcycle seat, belt, saddle, furniture, automotive interior, sports equipment and many others. All of these leather products need to be cleaned and conditioned well so that they can keep their amazing look and avoid deterioration. And the best way to do this is by acquiring a quality leather cleaner, conditioner and protector. In this Leather Honey Reviews article we will explain why people love to buy this conditioner! In this review, we are going to discuss about one of the best leather conditioner which is leather honey. This conditioner can be applied best after you use leather honey leather cleaner which is the best sealing leather cleaner on Amazon at the moment. The conditioner from leather honey is non-toxic, repellent to water and rain, has a long lasting formula and can be applied on all kinds of leather. This makes it to be special and very effective in conditioning of leather products. From the year 1968, Leather Honey has been offering quality leather cleaner and leather conditioner products to customers. This is a brand owned by a small family in the USA. It has particularized in creating the best leather cleaner and conditioner on the market. Its leather cleaner has now been rated #1 in leather care products. The brand offers unlimited lifetime guarantee on all of its products and customers can return product at free will if they aren’t satisfied. Long lasting formula – one of the factors that separates leather honey brand from other top leather conditioners is its long lasting formula. It has a formula that can be applied and remain functional for not less than six months. This is not usually the case with most of the other leather conditioner brands as they normally don’t last more than a month. Applicable on all types of leather – another great feature about leather honey conditioner is that it can be used on all types of leather. Some conditioners on the market just work on a few types of leather and aren’t as effective as leather honey. Eco-friendly conditioner – one of the important factors that people look at is whether the protector is made of toxic or non-toxic substances. Leather honey is made up of non-toxic substances and thus it’s good for the environment. Odorless restorer – in addition, this conditioner is odorless and doesn’t have the strange smells that toxic leather restorers usually have. Affordable price – compared to other top brands, leather is offered at a very nice price even though it has amazing qualities when it comes to conditioning and protecting leather. Quality product – definitely, this is a high quality leather restorer as many people highly recommend it. Not only is it made by one of the notable leather care product brands, but it also has the outstanding qualities. Effective performance – for deep conditioning and protecting of your leather items, use leather honey. It performs well in ensuring that new leather is protected while the old one is excellently restored. Also, it doesn’t stick thus wiping it away is very easy and fast. Unlimited lifetime warranty – the brand backs up its excellent quality with an unlimited satisfaction guarantee and a great customer service to its clients. That’s why it has several positive reviews online which praise quality and customer service. For you to understand more about the leather honey leather conditioner, we’ve created a broad review on the same below, discussing its features and advantages it offers its users. Leather honey leather conditioner is regarded by many leather users as the best leather protector on the market. Mad by this famous brand owned by a family, the leather honey leather conditioner has excellent ingredients that are non-toxic and good to the environment. It is odorless and doesn’t have the funny smell that low quality leather cleaners come with. It has a long lasting formula that can stay intact for six month after being applied. Most of the brands take just a month. As well, it can be used on all types of leather such as motorcycle seats, purse, boots, upholstery, automobile seat, gloves, briefcase, shoes, baseball mitts, handbags, tack, sports equipment and saddles, among many others. It is also made in the USA by and hand-bottled by the same family for more than 50 years. They offer great customer support to clients and provide a 100% lifetime satisfaction guarantee. With such qualities, you can consider this leather protector to leave your leather feeling and looking wonderful. It is made up of a non-toxic and non solvent formula which is good for the environment. It functions well in restoring and conditioning of old leather, and at the same time protects and softens new leather. The conditioner has been proven to penetrate deep into the leather’s pores, heightening flexibility and long-lastingness. It has a long lasting formula that may take more than six months after being applied. They offer great customer service and provide a 100% lifetime satisfaction guarantee to buyers. Leather honey can be applied on all types of leather, which include leather furniture and upholstery, boots, saddles, automobile seats, purses, gloves and motorcycle seats. It is made in the USA which means that it meets several standards and it’s of a high quality. This product has been highly rated on Amazon as the thousands of buyers who have left behind reviews have given it a general rating of 4.4 stars out of the possible 5 stars. This is an indication that the conditioner is of a high quality as most of the reviews praise how effective the leather restorer is and applauds its great customer support. Leather honey leather conditioner has so many wonderful properties that make it to be considered the best leather restorer on the market. It has a strong and long lasting formula that is non-toxic and odorless. It can be applied on all types of leather making it to be versatile in use. Leather honey repels against rain, water and snow and prolongs the life of leather products. Also, the leather protector brand offers a 100% lifetime satisfaction guarantee to buyers and it’s made in the USA. Such qualities enable this conditioner to deeply penetrate into the leather, thus making it look new and beautiful. 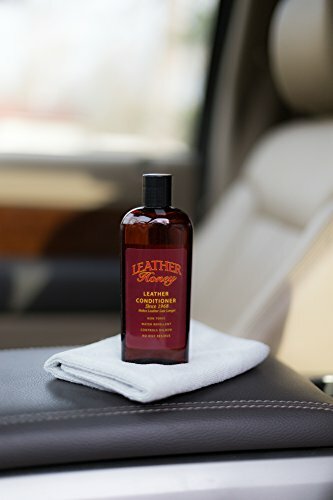 If you’ve been using other leather cleaner and conditioning products but haven’t got excellent results, then try out leather honey leather conditioner for outstanding results. Get to condition your old leather while protecting and softening your new leather with this top leather restorer. Hope you’ve found this Leather Honey Reviews to be really helpful in your quest to know more about leather honey leather restorer.